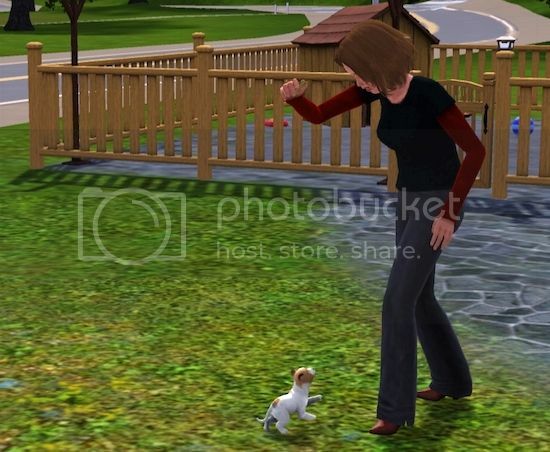 Aw, look at my sim's little dog! Slight cuteness overload in the game today. You sure that's not a dog but a guinea pig? Aw, my poor little Elsie! Or whatever I called her (I can't quite remember!). I think we'd better book you in for an eye test in the new year. 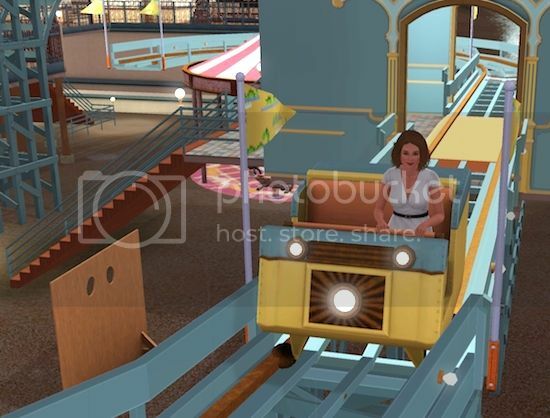 I gave myself Roaring Heights and The Boardwalk for Christmas. Happy Christmas, Caspin. Why thank you, Caspin! You are most welcome. The first place I sent my sim was the library, for speedy reading purposes. I must say, the place is a little ..... bare! 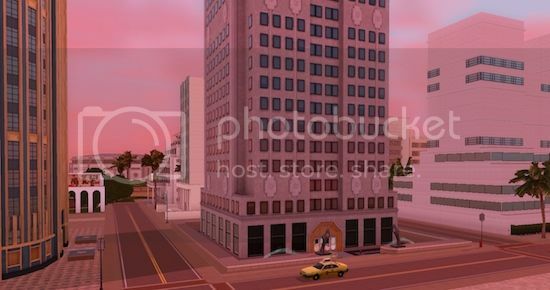 It is otherwise a good-looking town, if a little on the pink side. Ideal if you like a bit of city, a bit of beach and a bit of village. 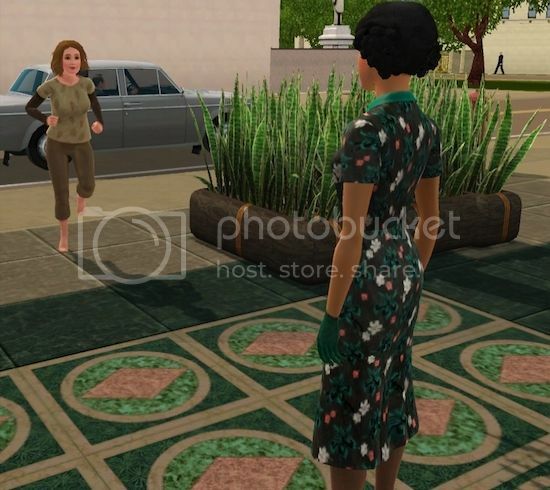 I was pleased to see that sims in Roaring Heights still act like complete crazies. I need to do my homework right now. Where in this spacious area shall I sit? Aha! 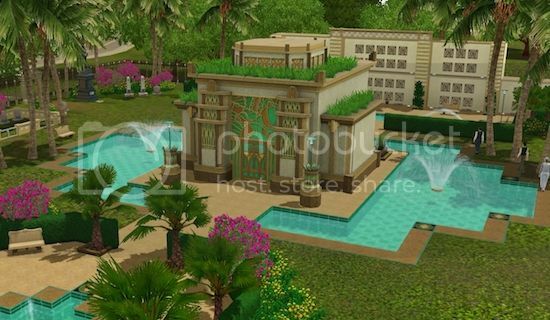 The most fantastic graveyard awaits those sims who pass over! It even comes with a bunch of mobsters running around the right hand side there! The roller-coaster at The Boardwalk is OK. I only had one go on it so far and it was a reasonably entertaining addition. Put your hands in the air! The ice-cold, rainy air. Yay! 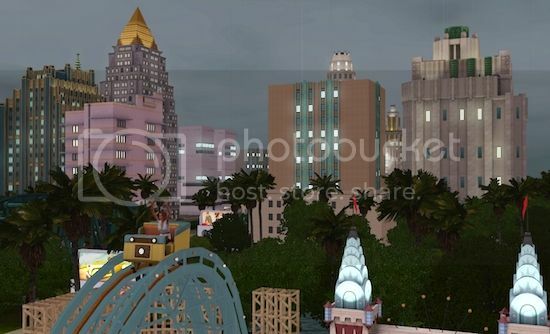 The skyscrapers look great though, don't they. 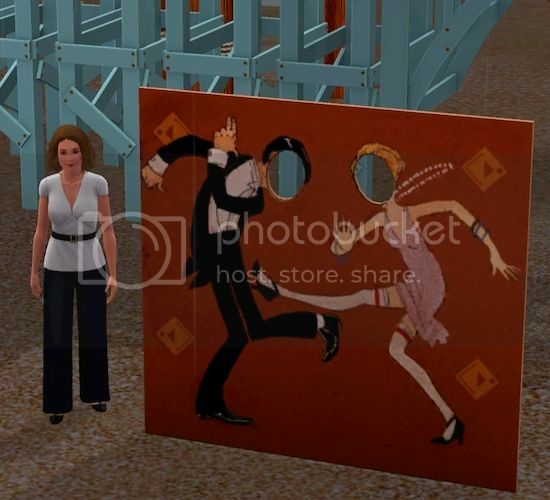 Why oh why can I not stick Ollie and Minty's sim in this board and chuck tomatoes at them. Why?! Finally, here's a question. Does anyone know what is going on with work outfits? I thought you used to be able to change them. Now they seem chosen by the game - and badly! Why am I attending a part-time job at the bookshop in what looks to be beige pyjamas and barefoot? I'm already in danger of being snubbed by my Roaring Heights neighbours for being so audaciously unladylike as to run around town with non-coiffed hair, hatless and (brace yourselves) gloveless. Another weird load of stuff in my game today. 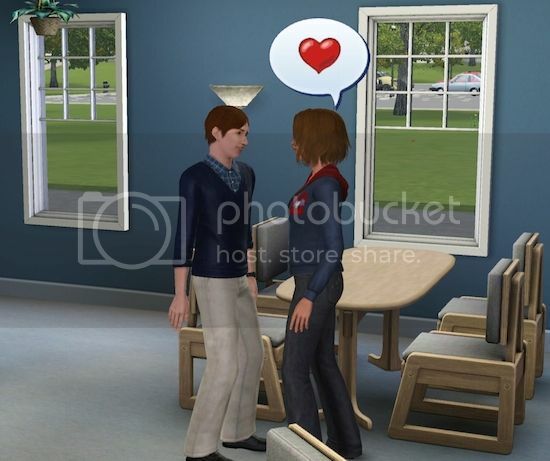 Maybe this is why I like playing Sims so much - it's sufficiently weird to make life seem normal. I had two simple aims for the day - to buy a nicer oven and to get a degree in communications. Straightforward stuff really. Yet neither has been achieved. Why? Well for a start I spent too much time eating chocolate gnomes. Why would you use a fork? If someone presented me with a 10-inch high chocolate gnome, I wouldn't tackle it with a fork. I'd just shove it my my face. So genteel with her cutlery! Since going into CAS puts my game in great danger of crashing, I try to avoid it. Unfortunately this means that the game will always be allowed to choose my outfits for fancy dress parties. 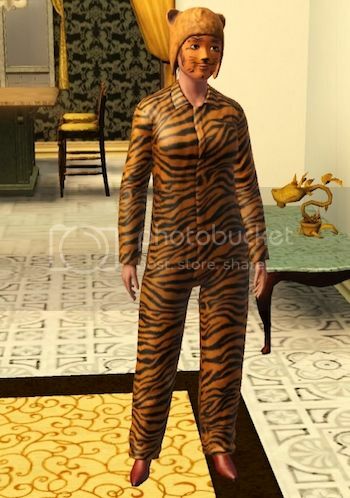 That, ladies and gentlesims, is not something I would wear. I assure you. They should not sell these things for humans that are older than 7 years and the same rule should apply in sims. Urgh! I did manage to go to sim university and made a start on that degree. But really there are too many distractions. Like joining the running club, perhaps. 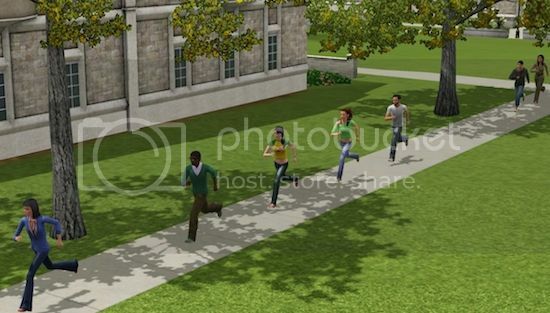 At one point almost all of the sim students were running in a single line across the campus. So bizarre! Then there's the nerds in need of some love. 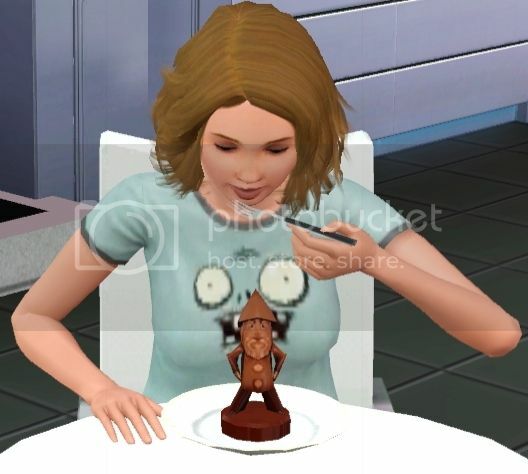 My sim can supply that! Lucky boy eh? He's not going to know what hit him! And finally a bit of singing? The mobile radio whatsit is a strange piece of kit. It looks to me like a cross between some retro apparatus from an old physics lab and a cheap karaoke machine. It's not a good idea to let me sing. I am reliably informed that it sounds very much like Babe the pig singing and I can't disagree. I think snow has to be one of the best additions to TS3. At times I develop an obsession with building as many snowmen as possible. 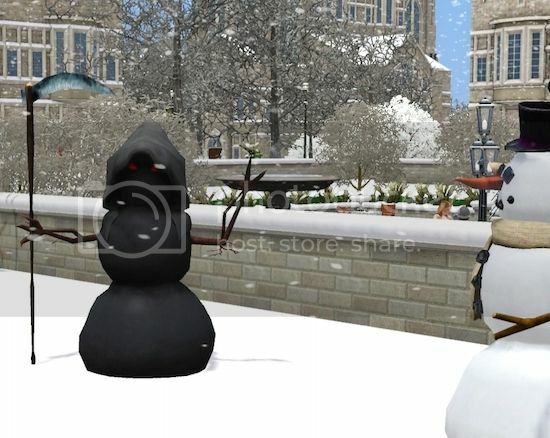 What does annoy me, however, is that no matter how many snowmen an ordinary sim builds, they don't get to build the freaky ones, like Grim. I want to build a Snow Reaper! That Grim snowman is fab! Is there any escape from Game of Thrones? No, all my sims are obsessed with reading it. Ah well, keeps them quiet and out of trouble.